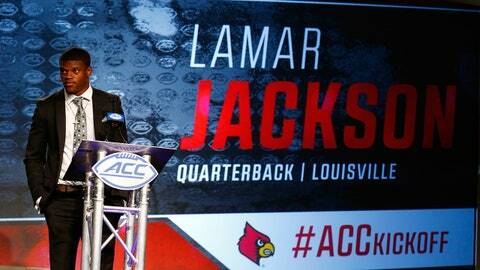 Lamar Jackson and the Cardinals open the season Sept. 2 against Purdue in Indianapolis. CHARLOTTE — Dino Babers just had to find out, if only to get the word back to his defense. The Syracuse coach walked up to Louisville quarterback Lamar Jackson — the reigning Heisman Trophy winner — during Thursday’s opening day of the ACC Kickoff at the Westin Charlotte, and grabbed his arm. The last time Babers saw Jackson in action left that up for debate. The sophomore would set a slew of Louisville, ACC and FBS records in totaling 3,543 yards and 30 TDs through the air and another 1,571 yards and 21 touchdowns. But against Babers’ Orange on Sept. 9, Jackson had his national coming out party, throwing for 411 yards and a touchdown and running for 199 yards and four more scores — and there was The Hurdle. Jackson leapt over defensive back Chauncey Scissum, at the goal line, a 9-yard TD that got an Air Jordan-esque treatment with an “Air Jackson”logo. Hence, Babers needing to make sure Jackson was, actually, mortal. But in terms of the college football universe, Jackson is currently its epicenter. He’s not just man and he’s entirely machine, but he is something more than every other player who will take the field this fall. He’s a reigning Heisman winner, and with that designation comes expectations and — something that Jackson has shown he can clear — hurdles. It’s been 42 years since Ohio State’s Archie Griffin claimed his back-to-back trophies, Sims, Detmer, White, Leinart, Tebow, Bradford, Ingram, Manziel and Winston all failing to equal him, and none in the past 40 years coming closer than third (Jason White in ’04; Tim Tebow in ’08). Jackson, as expected, isn’t thinking of joining the fraternity within the fraternity with Griffin — in these summer months, because it wasn’t something he even considered last year. If Jackson’s junior season has a theme, it would appear to be setting the stage for his transition to the NFL, whenever that comes. “You know, there’s no doubt about that,” said Cardinals coach Bobby Petrino. He will still be adhering to his philosophy to FTS — “Feed the Studs” as he puts — to continue to highlight Jackson’s unique skillset by featuring QB run plays, zone reads and option plays. But he’s also putting Jackson under center more to set up the running game, play-action passes and feature Jackson’s ability to throw the deep ball. Only four returning Power-5 QBs had more completions of 60 yards than Jackson’s five. “We’re going to give him his opportunities to make big plays and his opportunities to handle things that he did so well last year,” Petrino said. “We’re just trying to improve upon it and be a better overall offense. If there were knocks against Jackson last year, they were his completion percentage and interceptions. He hit on 56.2 percent of his passes, which ranked 86th in FBS, and in a 36-10 loss to Houston on Nov. 17 that spoiled the Cardinals’ hopes of making the College Football Playoff, Jackson hit at a 46.5 percent rate. In the Citrus Bowl defeat to LSU, he was at a season-los 37 percent. Add in his nine picks — three of which came in the regular season-ending loss to Kentucky — and he ranked 25th in pass efficiency (148.8). If accuracy is the focus for Jackson, Jaire Alexander, an All-American candidate at cornerback, says he’s definitely seen an improvement. Unfair or not, Lamar Jackson is already playing from behind in the 2017 Heisman race. USC passer Sam Darnold is Las Vegas’ favorite — with 9-2 odds to Jackson’s 8-1 — and the possibility of equaling Griffin seems more far-fetched now than it did in 1980 when Oklahoma’s Billy Sims, the first player to try and follow Griffin’s lead, finished second in his follow-up campaign. Florida State’s Jameis Winston was sixth in his bid in 2014 and Texas A&M’s Johnny Manziel came in fifth in ’13, and whatever awaits Jackson, he’s earned praise internally at Louisville. He’s done that simply by staying the same Lamar Jackson. And, as Baber can attest, he’s most definitely human.